There are eighteen native species and five introduced species of Salix in Britain including White Willow (S. alba), Goat Willow (S. caprea), Hybrid Crack-willow (S. x fragilis), Purple Willow (S. purpurea), Creeping Willow (S. repens), Almond Willow (S. triandra) and Osier (S. viminalis). The BSBI provide a downloadable plant crib for Salix. Thirty-eight British miners are recorded on Salix. The agromyzid Hexomyza simplicoides forms twig galls on Salix in Britain. The agromyzid Phytobia cambii feeds in the cambium of Salix and Populus in Britain and also Alnus, Betula and Carpinus elsewhere. The coleophorid Coleophora albidella is recorded as a Bud-borer and case-bearer on Salix in Britain. A key to the European miners recorded on Salix is provided in Bladmineerders van Europa. 1a > Leaf-miner: A narrow, upper surface winding linear mine, brown when old. 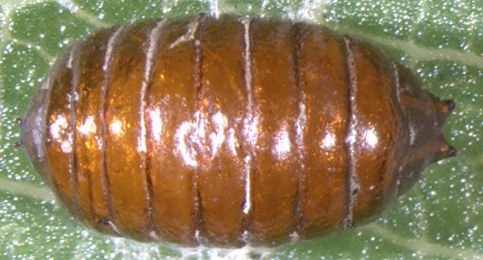 Pupation external (Spencer, 1976: 313 (fig. 563), 314). A hardly widening corridor from beginning to end, yellow green in colour. The start is lower-surface, but after some time the mine becomes upper-surface. Part of the frass in thread fragments. Pupation outside the mine; exit slit in upper epidermis (Bladmineerders van Europa). On Salix aurita and Salix caprea in Britain also Salix myrsinifolia elsewhere. Widespread in Britain. Widespread in western Europe. Aulagromyza fulvicornis (Hendel, 1935) [Diptera: Agromyzidae]. 1b > Leaf-miner: Blotch mine. Larva forming a greenish-black blotch mine (Spencer, 1976: 92), which quickly turns brown, frequently several larvae feed together (Spencer, 1972b: 42). Elongated, upper-surface blotch, on Poplars much larger than on Willows. At first the colour is green, but this quickly turns into an opaque brown. The larvae distinguish these mines from those of Leucoptera sinuella and Zeugophora species. They are yellow, and often live communal. They leave the mine before pupation; the exit slit is in the upper epidermis (Bladmineerders van Europa). On Populus and Salix in Britain and elsewhere. Widespread in Britain and continental Europe. Also recorded in Canada. Agromyza albitarsis Meigen, 1830 [Diptera: Agromyzidae]. 2b > Leaf-miner: A yellowish blotch. Pupation internal or external; a large exit slit is cut and the puparium not infrequently remains at the end of the mine (Spencer, 1976: 324). Yellowish primary blotch, almost invariably lower-surface. Pupation generally outside the mine; less often the puparium is formed in the opening, sometimes even in the closed mine. The exit slit (when made by the larva) has a characteristic shape: a perfect semi-circle (Bladmineerders van Europa). An elongated yellowish blotch, either upper surface, lower surface or starting lower surface and ending upper surface (British leafminers). On Salix alba, Salix fragilis, Salix triandra and Salix viminalis in Britain and additional species of Salix elsewhere. Widespread in Britain and continental Europe. Aulagromyza tridentata (Loew, 1858) [Diptera: Agromyzidae]. 1b > Leaf-miner, galler or stem miner, but not a case-bearer: The larva lives mainly inside the mine. Mine usually contains frass. In later instars the larva may live sandwiched between two more or less circular sections cut from the leaf. 2a > Leaf-miner and case-bearer: The full grown larva lives in a dull black pistol case of c 9 mm that, with a mouth angle of 80-90° stands erect on the leaf. Characteristic is the presence of some ear-like flaps. At least after the hibernation the larvae do not mine any more, but rather cause skeleton feeding (Bladmineerders van Europa). On Carpinus, Corylus, Quercus and Salix in Britain and Betula, Carpinus, Corylus, Fagus, Quercus, Malus, Prunus, Pyrus, Sorbus and Salix elsewhere. Widespread though not common in Britain. Widespread in continental Europe. Coleophora currucipennella Zeller, 1839 [Lepidoptera: Coleophoridae]. 2b > Leaf-miner and case-bearer: As with other Coleophorids, the larva forms a case from the leaf, in which it overwinters. The case formed by this species is long, slender and frequently woolly in appearance (UKMoths). Bivalved composite leaf case of 8-10 mm, rather strongly compressed and keeled, with a mouth angle of 30-45° (Bladmineerders van Europa). On Betula, Myrica and Salix in Britain and Myrica and Salix elsewhere. Throughout the whole of Britain, except the far north of Scotland. Also recorded in the Republic of Ireland. Widespread in continental Europe. Coleophora lusciniaepennella (Treitschke, 1833) [Lepidoptera: Coleophoridae]. 2c > Leaf-miner and case-bearer: The case resembles that of C. violacea, but does not lie so flat again the leaf as this species (having a mouth angle of 30 to 50°). C. violacea also has a case which bulges in the middle, whereas in C. potentillae the case tapers towards the posterior (British leafminers). Immediately after emergence the larva makes a full depth, quickly widening, corridor, with frass as small grains in a broad central band. Finally results a blotch of 2 x 5 mm, from which the youth case is cut. The fully developed case is a hairy, greyish brown to silver grey lobe case of about 1 cm long, with a clearly laterally compressed end; the mouth angle is about 90°. The case is difficult to separate from that of C. ochripennella (Bladmineerders van Europa). On Betula, Agrimonia, Crataegus, Filipendula ulmaria, Fragaria vesca, Geum, Helianthemum nummularium, Potentilla, Prunus spinosa, Rosa, Rubus caesius, Rosa fruticosus and Salix cinerea in Britain plus Malus sylvestris, Ribes, Sanguisorba and Spiraea elsewhere. Widespread in Britain and in continental Europe. Coleophora potentillae Elisha, 1885 [Lepidoptera: Coleophoridae]. On Alnus, Betula, Corylus, Ulmus and Sorbus, but not yet on Salix, in Britain plus Carpinus, Mespilus, Ostrya, Hippophae, Ribes, Myrica, Forsythia, Amelanchier, Chaenomeles, Cotoneaster, Crataegus, Cydonia, Eriobotrya, Malus, Prunus, Sorbus, Spiraea, Populus and Salix elsewhere. This is probably the commonest species of British coleophorid, and is found throughout the British Isles. Widespread in continental Europe. 2e > Leaf-miner and case-bearer: The early case is tiny and the larva makes a series of tiny holes on the leaf. After overwintering it makes a shiny pistol shaped case in spring and window feeds (British leafminers). The young larva, before hibernation, makes tiny mines, sometimes tens in one leaf. After hibernation window feeding is done. In this latter stage the larva lives in a shining black pistol case of about 7 mm, that, with a mouth angle of 70°-80°, stands almost perpendicular on the leaf (Bladmineerders van Europa). On Crataegus, Malus, Prunus, Pyrus and Sorbus, but not yet on Salix, in Britain plus numerous genera and species of several plant families elsewhere. Occurs in England and Wales, commoner in the south. Widespread in continental Europe. Coleophora anatipenella (Hübner, 1796) [Lepidoptera: Bucculatricidae]. 3a > Galler and leaf-miner: A gall in the leaf petiole, later the mine is in the leaf-blade, in a 'green island' (British leafminers). The egg lies on top of the midrib (rarely a thick lateral vein), mostly c. one cm below the visible part of the mine, generally not far from the base of the leaf. The larva at first hollows the midrib (on the second picture from the top the far right, darkened, part of the midrib has been mined out). Only in its last stage the larva leaves the midrib and makes a triangular blotch, adjacent to the midrib. When the larva isn't yet too large it retreats into the midrib during feeding pauses. Partly caused by these movements the frass usually lies in two stripes in a V-pattern, parallel to the sides of the blotch. The mines often are found in yellowed leaves in green islands, often in already Fallén leaves (Bladmineerders van Europa). On Salix in Britain and elsewhere. Widepread in England, Wales and Scotland. Also recorded in the Republic of Ireland. Widespread in continental Europe. Ectoedemia intimella (Zeller, 1848) [Lepidoptera: Nepticulidae]. 3b > Stem-miner: The eggs are laid in the stem in the current year's growth and the whitish mine progresses up the stem terminating at the base of the leaf. The larva curls over the leaf edge to pupate (Langmaid and Corley, 2007). Oviposition on a young twig. From there a long corridor is made in the bark, up to 30 cm in length, running up or down, hardly widening. Finally the corridor enters a petiole and a leaf where, close to the base, at the upperside, a white cocoon is spun in which pupation takes place (Bladmineerders van Europa). 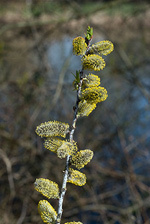 On Salix in Britain. Hosts elsewhere unknown. Known only from Hants (Havant) and West Sussex in Britain and from Portugal. Phyllocnistis ramulicola Langmaid & Corley, 2007 [Lepidoptera: Gracillariidae]. 3c > Leaf-miner: Feeds initially in an underside epidermal mine then folds the leaf down (British leafminers). The larva first makes a distinctly folded lower-surface tentiform mine. After some time the mine is vacated and the larva lives free then in a leaf margin that has been folded downwards and is secured with silk. In small leaves the two halves are simply spun together in a pod. Two of these leaf folds are made and eaten out. The folds with the free living larva strongly resembly the work of a sawfly larva on the same plant; however, then no silk is used to anchor the leaf margin (Bland, 1993a) ( Bladmineerders van Europa). On Salix in Britain and elsewhere. First discovered in Scotland in 1983. Widespread in continental Europe. Callisto coffeella (Zetterstedt, 1839) [Lepidoptera: Gracillariidae]. 3d > Leaf-miner: Initially a lower epidermal gallery which leads to a blotch at the leaf-edge. Subsequently creates two or three cones by folding the edge or tip of a leaf downwards (British leafminers). The mine begins with an unusually long lower-surface epidermal corridor that often follows the midrib for some distance, but finally turns towards the leaf margin, where a small blotch is made of up to 1 cm in diameter. The blotch initially is fully epidermal, but later the larva starts consuming parenchyma, silk is deposited, and the blotch begins to develop into a somewhat contracted tentiform mine. In the end the mine is vacated and the larva continues living freely under a leaf fold that has been fixed with silk, or in a leaf tip that has been turned into a cone. Pupation in a shiny cocoon at the underside of the leaf (Bladmineerders van Europa). On Betula, Populus and Salix in Britain and Populus, Salix and Myrica elsewhere. Widespread in Britain, Ireland and continental Europe. Caloptilia stigmatella (Fabricius, 1781) [Lepidoptera: Nepticulidae]. 3e > ? Leaf-miner: The larvae feed on a range of deciduous trees, windowing leaves in autumn and eating the buds, catkins, young shoots and then spun leaves in the spring (UKMoths). Cocoon formed in soil or where the larva fed British leafminers. On Corylus, Crataegus, Populus, Quercus and Salix in Britain and Alnus, Betula, Corylus, Crataegus, Populus, Quercus and Salix elsewhere. Widespread in Britain. Also recorded in the Republic of Ireland. Widespread in continental Europe. Gypsonoma dealbana (Frölich, 1828) [Lepidoptera: Tortricidae]. 3f > Leaf-miner: Oviposition in the very leaf tip. From there a very deep upper surface blotch extends downwards. The blotch, that is very transparent, can occupy a large part of the leaf. Mostly the entire width of the leaf is mined out, but the broad leaves of the Goat Willow are mined at one side of the midrib only. Pupation within the mine in a large, transparent, discoidal cocoon (Bladmineerders van Europa). The larvae of sawflies have at least six thoracic legs (although they may be reduced or absent), a head capsule and chewing mouthparts with opposable mandibles but no abdominal legs. On Salix in Britain and elsewhere. Widespread in Britain including Dorset, South-west York, Surrey and West Cornwall. Also recorded in the Republic of Ireland. Widespread in continental Europe. Heterarthrus microcephalus (Klug, 1818) [Hymenoptera: Tenthredinidae]. 3g > Leaf-miner: As far as known, larvae, pupae and mine are identical to those of I sequensi (= I. populi) - almost round, brown to brownish black, upper surface, very opaque blotch, about 1 cm in diameter, without an initial corridor. Upper epidermis leathery in colour. Often several mines in a leaf. All frass as a tar-like film on the floor of the mine (Bladmineerders van Europa). Pupation in the mine; pupa not in a cocoon. On Salix in Britain and elsewhere. Widespread in Britain and continental Europe. Isochnus foliorum (Müller, 1764) [Coleoptera: Curculionidae]. 3h > Leaf-miner: Almost round, brown to brownish black, upper surface, very opaque blotch, about 1 cm in diameter, without an initial corridor. Upper epidermis leathery in colour. Often several mines in a leaf. All frass as a tar-like film on the floor of the mine (Bladmineerders van Europa). On Populus and Salix in Britain and elsewhere. Recorded from East Kent and East Sussex and Hants in Britain. Widespread in continental Europe. Isochnus sequensi (Stierlin, 1894) (Stierlin, 1894) [Coleoptera: Curculionidae]. 3i > Leaf-miner: A long, whitish smoothly-curved upper-surface mine with broken black frass (British leafminers). Oviposition is by means of an ovipositor; what remains is a small scar: no egg shell is visible at the start of the mine. From here a long, sometimes very long, slender, full depth corridor winds throught the leaf, not steered by leaf margin or the leaf venation. The midrib is crossed effortless; the corridor frequently also crosses itself; the section of the leaf cut off then usally turns brown and dies off. Frass in a narrow central line. The larva vacates the mine prior to pupation through an exit in the upper epidermis. The vacated larval chamber is proportionally much longer than in the case of Stigmella mines ( > 3 x longer than broad) (Bladmineerders van Europa). Pupation in a silken cocoon suspended from threads attached to food plant or other vegetation (British leafminers). Polyphagous. On numerous genera and species in several plant families, including Salix, in Britain and elsewhere. Widespread in Britain and continental Europe. Also recorded in the Republic of Ireland. Lyonetia clerkella (Linnaeus, 1758) [Lepidoptera: Lyonetiidae]. 3j > Leaf-miner: A tortuous lower epidermal mine with a central brownish frass-line. The larva then mines into the petiole and subsequently into a second leaf, normally opposite, where it creates another similar epidermal mine (British leafminers). Very long, purely epidermal, corridor, either upper- or lower-surface. The mines are restricted to the terminal leaves of young shoots. The mine passes from one leaf to the other by way of the shoot epidermis. Frass in a broad fuzzy central line. The corridor ends upon a leaf margin, where pupation takes place under a folded part of the margin, not in an evident cocoon (Bladmineerders van Europa). On Salix in Britain and elsewhere. This rather local species is distributed in the south and south-east of England, and is generally uncommon. Widespread in continental Europe. Phyllocnistis saligna (Zeller, 1839) [Lepidoptera: Gracillariidae]. 3k > Leaf-miner: A large lower surface mine, which contorts the upper surface of the leaf. A very similar mine to P. hilarella and it needs to be bred out for a positive identification (British leafminers). Rather large, lower-surface tentiform mine, mostly between two side veins. The upperside is fairly strongly inflated. The underside has many narrow folds, not easily seen because of the indumentum at the underside of the leaf. Frass pakced in a corner of the mine. Neither mine, cocoon or pupa can be distinguished from those of Ph. hilarella (Gregor and Patocka, 2001a) (Bladmineerders van Europa). On Salix in Britain and elsewhere. England and Wales. Widespread in continental Europe. 3l > Leaf-miner: The leaf surface is often contorted. Can be confused with P. dubitella (British leafminers). Rather large, lower-surface tentiform mine, mostly between two side veins. The upperside is fairly strongly inflated. The underside has many narrow folds, not easily seen because of the indumentum at the underside of the leaf. Frass pakced in a corner of the mine. Neither mine, cocoon or pupa can be distinguished from those of Ph. dubitella (Gregor and Patocka, 2001a) (Bladmineerders van Europa). On Salix in Britain and elsewhere. Widespread throughout Britain. Also recorded in the Republic of Ireland. Widespread in continental Europe. Phyllonorycter hilarella (Zetterstedt, 1839) [Lepidoptera: Gracillariidae]. 3m > Leaf miner: Large, lower-surface tentiform mine with one sharp fold. Frass in the opposite corner of the mine (Bladmineerders van Europa). Phyllonorycter pastorella (Zeller, 1846) [Lepidoptera: Gracillariidae]. On Salix in Britain and elsewhere. A relatively local and uncommon species, distributed mainly in the coastal counties around the British Isles. Also recorded in the Republic of Ireland. Widespread in continental Europe. Phyllonorycter quinqueguttella (Stainton, 1851) [Lepidoptera: Gracillariidae]. 3o > Leaf-miner: The larvae feed in a blotch on the underside of a leaf of sallow, causing the leaf edge to curl under when at the edge (UKMoths). Fairly small, lower-surface, tentiform mine, often toching the leaf margin. 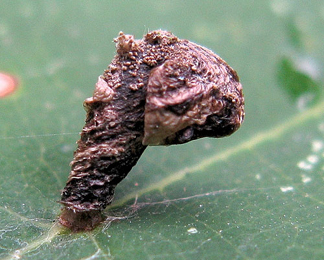 The reddish brown pupa in a flimsy, whitish of very pale yellowish cocoon; possibly the cocoon sometimes is missing altogether. Frass packed in a corner of the mine (Bladmineerders van Europa). Cannot be separated (without opening mine or breeding moths) from mines of other sallow-feeding species (British leafminers). Pupa reddish brown, in a light brown cocoon without frass. On Populus and Salix in Britain and elsewhere. Throughout the British Isles. Also recorded in the Republic of Ireland. Widespread in continental Europe. Phyllonorycter salicicolella (Sircom, 1848) [Lepidoptera: Gracillariidae]. 3p > Leaf-miner: The mine is underside, strongly creased and contracted causing leaf-edge to fold down (British leafminers, as Phyllonorycter salictella viminiella). Rather large, lower-surface tenntiform mine, generally against the leaf margin, often low in the leaf. Lower epidermis strongly folded; the mine is strongly contracted, causing the leaf margin to fold tube-like over the mine. All frass packed in a corner of the mine (Bladmineerders van Europa). On Populus and Salix in Britain and Salix elsewhere. Throughout England and Wales and into southern Scotland and there are scattered records from Ireland and northern Scotland. Widespread in continental Europe. Phyllonorycter salictella (Zeller, 1846) [Lepidoptera: Gracillariidae]. 3q > Leaf-miner: The leaf is curled over by the mine, which is underside and usually near the leaf base (British leafminers). Lower-surface tentiform mine against the leaf margin, mostly not far from the petiole, often two in a leaf. The mine is contracted tube-like. Frass packed in a corner of the mine. Pupa yellowish brown. No visible cocoon (coincides with the lining of the mine) (Bladmineerders van Europa). On Salix in Britain and elsewhere. Britain including North Hants. Also recorded in the Republic of Ireland. Widespread in continental Europe. Phyllonorycter viminetorum (Stainton, 1854) [Lepidoptera: Gracillariidae]. 3r > Leaf-miner: The mine is underside, strongly creased and contracted causing leaf-edge to fold down (British leafminers). Phyllonorycter viminiella Sircom, 1848 [Lepidoptera: Gracillariidae]. 3s > Leaf-miner: Generally small, upper-surface, pear-shaped mines, half of their surface stuffed with frass. In the frass-free part an oval, flattened larva. Often several mines in a leaf. Prior to oviposition the larvae eat, a large number of tiny holes in the leaves (Bladmineerders van Europa). On Betula, Myrica, Populus and Salix in Britain and elsewhere. Widespread in Britain, Ireland and continental Europe. Rhamphus pulicarius (Herbst, 1795) [Coleoptera: Curculionidae]. 3t > Leaf-miner: An early gallery filled with frass, later leaving clear margins, finally a blotch (British leafminers). Egg at the upper- or underside of the leaf, usually close to the midrib or leaf margin. The mine is a somewhat widening corridor. Its course is variable, but generally it contains several long, more or less straight, segments. The black frass almost fills the first half of the corridor. Later the frass line becomes relatively narrower, and is more often interrupted. Pupation external, exit slit in the upper epidermis (Bladmineerders van Europa). On Salix in Britain and elsewhere. England, Wales and Ireland. Widespread in continental Europe. Stigmella obliquella (Heinemann, 1862) [Lepidoptera: Nepticulidae]. 3u > Leaf-miner: A contorted gallery leading to small blotch (British leafminers). Egg at the underside of the leaf, mostly close to a vein or the leaf margin. The mine, a corridor, is rather variable, mostly strongly contorted, sometimes even forming a secondary blotch, but at times only a little sinuous, running along a vein or following the leaf margin. The frass line is broad, especially in the first half of the mine (Bladmineerders van Europa). On Myrica and Salix in Britain and elsewhere. Widespread in Britain, Ireland and continental Europe. Stigmella salicis (Stainton, 1854) [Lepidoptera: Nepticulidae]. 3v > Leaf-miner: Egg invariably at the leaf underside. From there runs a short gallery, often partly following the leaf margin, almost stuffed with frass. The corridor widens into a blotch that may occupy half a leaf; the frass here is dispersed. Pupation extrernal. Vacated mines turn black (Bladmineerders van Europa). On Salix in Britain and elsewhere. East Kent. Also recorded in the Republic of Ireland. Widespread in continental Europe. Stigmella zelleriella (Snellen, 1875) [Lepidoptera: Gracillariidae]. 3w > Leaf-miner: Full depth, broad, transparent, brown, corridor that descends from the leaf tip along tje leaf margin. Frass in a stripe along the outer side of the mine. The mine ends in a round excision (Bladmineerders van Europa). On Salix in Britain and Populus and Salix elsewhere. North Hants and West Suffolk. Widespread in continental Europe. Tachyerges decoratus (Germar, 1821) [Coleoptera: Curculionidae]. 3x > Leaf-miner: Full depth corridor, beginning at the base of the midrib and very roughly following the leaf margin; all the while the corridor widens, until almost the entire leaf has been mined out. Frass, as coarse grains or thread fragments, in the centre of the mine. The larva pupates in the mine, in a globular cocoon made of secretion (Bladmineerders van Europa). On Betula, Corylus and Salix in Britain and Alnus, Betula, Corylus, Popoulus and Salix elsewhere. Only known in Britain from East Sussex. Widespread in continental Europe. Tachyerges pseudostigma (Tempère, 1982) [Coleoptera: Curculionidae]. 3y > Leaf-miner: A large, full depth transparent light brown blotch that expands irrespective of the leaf venation. Mine mostly in the distal half of the leaf, may eventually occupy half of its surface. The mine often tears in, and the leaf tip is disfigured (Bladmineerders van Europa).The larva eventually pupates in a globular cocoon within the mine (Bladmineerders van Europa). On Salix in Britain and Populus and Salix elsewhere. Widespread in Britain. Also recorded in the Republic of Ireland. Widespread in continental Europe. Tachyerges salicis (Linnaeus, 1758) [Coleoptera: Curculionidae]. 3z > Leaf-miner: Oviposition in the base of the midrib, without giving rise to an oviposition scar. 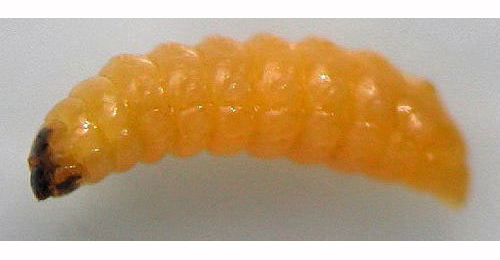 The larva initially bores inside the midrib. Later it leaves the midrib, forming a broad corridor in the blade, that widens into a blotch. Finally the larva pupates in a globular cocoon inside the mine. Because the mine develops at a time that the leaf is fully developed, mined leaves are not disfigured (Bladmineerders van Europa). On Betula, Corylus and Salix in Britain and Alnus, Betula, Corylus, ? Populus and Salix elsewhere. Widespread in Britain and continental Europe. Tachyerges stigma (Germar, 1821) [Coleoptera: Curculionidae]. 3za > Leaf-miner: Full depth blotch, invariably beginning at the leaf tip or the tip of a leaf lobe or tooth. Oviposition site covered by a black, shining drop of hardened secretion. Frass generally in long threads, but sometimes in elongated granules. Pupation in the mine, not in a cocoon (Bladmineerders van Europa). On Corylus avellana, but not yet on Salix, in Britain. On several genera and species in several plant families including Sorbus elsewhere. Widespread in Britain and continental Europe. Trachys minutus (Linnaeus, 1758) [Coleoptera: Buprestidae]. 3zb > Leaf-miner: All western European Zeugophora make large, blackish brown, upper-surface blotch. Oviposition at the leaf underside, in a small pit, that is covered by secretion. These oviposition marks remain visible as small, transparent points. 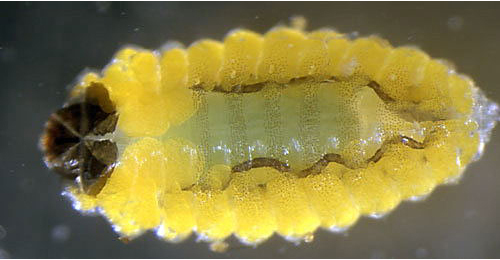 The larvae of Zeugophora species are yellow and flattened. They live communal, and leave the mine through an upper-surface exit slit (see Bladmineerders van Europa). On Populus, but not yet on Salix, in Britain and Populus and Salix elsewhere. Widespread in England and continental Europe. Zeugophora flavicollis (Marsham, 1802) [Coleoptera: Chrysomelidae]. 3zc > Leaf-miner: All western European Zeugophora make large, blackish brown, upper-surface blotch. Oviposition at the leaf underside, in a small pit, that is covered by secretion. These oviposition marks remain visible as small, transparent points. The larvae of Zeugophora species are yellow, flattened, and. They live communal, and leave the mine through an upper-surface exit slit (Bladmineerders van Europa). On Populus, but not yet on Salix, in Britain and Populus and ? Salix elsewhere. Widespread in England and continental Europe. Zeugophora subspinosa (Fabricius, 1781) [Coleoptera: Chrysomelidae].